Δε θα περιμέναμε τίποτα λιγότερο από την ΕΑ και την παρουσίασή της για τη φετινή Ε3 – αυτό είναι το νέο Battlefield 1. Βασισμένο στον 1ο Παγκόσμιο Πόλεμο, φέρνει το ‘only on Battlefield’ σε μια εποχή που μέχρι τώρα δεν έχουμε συνηθίσει να βλέπουμε στο gaming και υπόσχεται πως ποτέ ξανά μια online μάχη δε θα είναι ίδια. STOCKHOLM, Sweden – June 12, 2016 – DICE, an Electronic Arts Inc. (NASDAQ: EA) studio, invites you to join a world of discovery and epic warfare through ever-changing battles only in Battlefield™ 1. Intuitive destruction and dynamic weather ensure that no battle is ever the same. For even more gameplay possibilities, carve a path through walls and buildings, take down your enemies in creative ways, and leave your mark on the terrain around you through intuitive destruction. Through your actions, the pristine world around you will change into a battle-scarred landscape, changing the world forever. With dynamic weather you will need to adapt your tactics to weather changes as the elements play a part in the battle. Playing the same map on a bright day, in heavy fog, or rain will impact what you see and hear, forcing you to adapt your play style on an ever-changing battlefield. Operations introduces a completely new way to play multiplayer. In Battlefield 1 will you play a series of interconnected battles across multiple fronts. Play a sequence of battles where your actions have consequences beyond a single match, as you try to conquer territory or push back your attackers. At those times when you feel all is lost, call in the Behemoths – the largest fully player-controlled vehicles ever seen in Battlefield. Roam the battlefield and rain fire on your enemy to break their defenses. All-out war never felt so epic. Take control of the Armored Train, Air Ship, or the Battleship to dominate the battlefield across land, air, and sea. 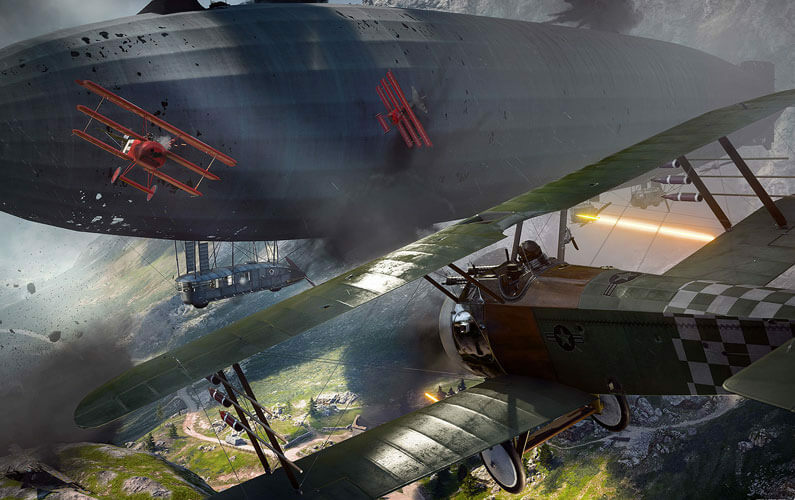 The Battlefield 1 open beta will be live later this summer. To get early access, players can sign up to become a Battlefield Insider HERE. They will also get access to in-game rewards, exclusive content, and sneak peeks at news about Battlefield 1 (plus news about other EA games, services, and events). Watch the Battlefield 1 gameplay trailer from EA PLAY HERE, and discover more on the Dawn of All-Out War at https://www.battlefield.com/en-gb . Battlefield 1 will launch on October 21st, 2016 worldwide on Xbox One, Origin™ for PC, and PlayStation®4. Players who pre-order the Early Enlister Deluxe Edition can begin playing on October 18*. EA Access and Origin Access members can play Battlefield 1 for a limited time before launch with Play First Trials. EA Access members receive a 10% discount when they purchase a digital version of the game on Xbox Live, and Origin Access members get a 10% discount when they purchase the game through Origin**.